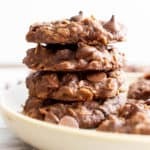 Whenever you hear the term “Peanut Butter Love,” you just know what they’re talking about (like these gluten free soft peanut butter cookies, these vegan chocolate peanut butter truffles, or perhaps… these homemade peanut butter cups). 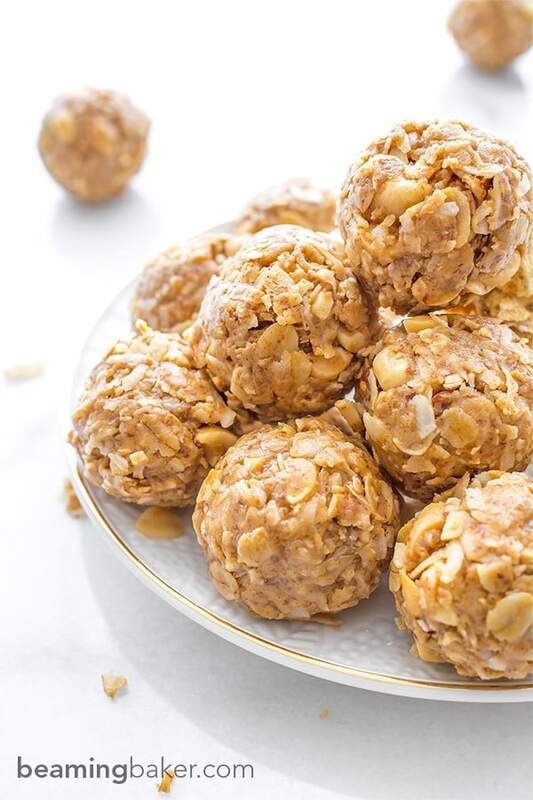 The thing about making these no bake peanut butter coconut bites is… well, the scent. Oh. My. Gahhhhhh…. the Scent. 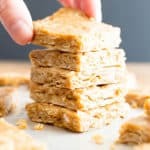 All throughout making these bites, I was a prisoner to the Scent: freshly chopped peanuts, peanut butter magic and shredded coconut. Mmm-mmm! That, my friends, is legit Peanut Butter Looooove. <— If you know exactly what I’m talking about, then you’ve got to try my healthy peanut butter granola recipe. 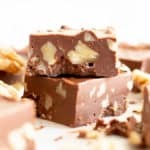 Thick layers of chocolate, peanut butter and then, wait for it… more peanuts and chocolate! YUM. 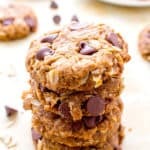 But if you’re totally giving me the stinkeye for even mentioning desserts, and not more energy treats, try these: Oil-Free Peanut Butter Oatmeal Breakfast Cookies (literally my family’s fave snack), no bake peanut butter coconut oatmeal cookies, no bake chocolate peanut butter cup oatmeal bars (my fave), and these super easy to make 3 ingredient no bake peanut butter oatmeal cookies (THE reader fave)!! 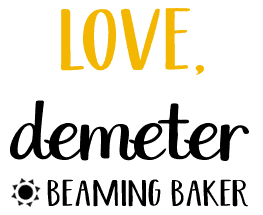 So how do I love peanut butter, let us count (but really eat) the ways! The funny thing is, this love for peanut butter just kind of snuck up on me. Isn’t that the best kind of love though? It happened just like it did with coconut. I didn’t see those cute, furry little fruits rolling straight at my heart until it was too late. I know, food TOTALLY = love for me. Am I embarrassed? I think not! I mean, don’t even get me started on coconut. Did you know that simply putting unsweetened, shredded coconut in a recipe makes it automatically sweeter? And more yummy? Gah! Don’t get me started on the madness/love/heart-crack-filling that is fresh, homemade peanut butter. Once you go there, you just regret eating regular ol’ storebought PB. Ya know? But then you kind of have to because, let’s face it, making homemade PB takes a while. No lie. Anyway, one of my favorite Peanut Butter Love recipes (this is a thing now, isn’t it?) is this amazing breakfast bar. They are just life-changing. Crispy, soft, indulgent-but-actually-pretty-good-for-you and just… EVERYTHING. They’re easy-to-make, energy-boosting, super filling and YUM to the max. I made and remade this recipe until it had the least amount of sugar possible, while still being delicious and lightly sweet. They also take just a couple of minutes to throw together. That, and a few fun/slightly-laborious-but-totally-worth-it minutes to roll out these bites. If you love peanut butter, coconut, or are just waiting for this special PB love to sneak up on you, try these. 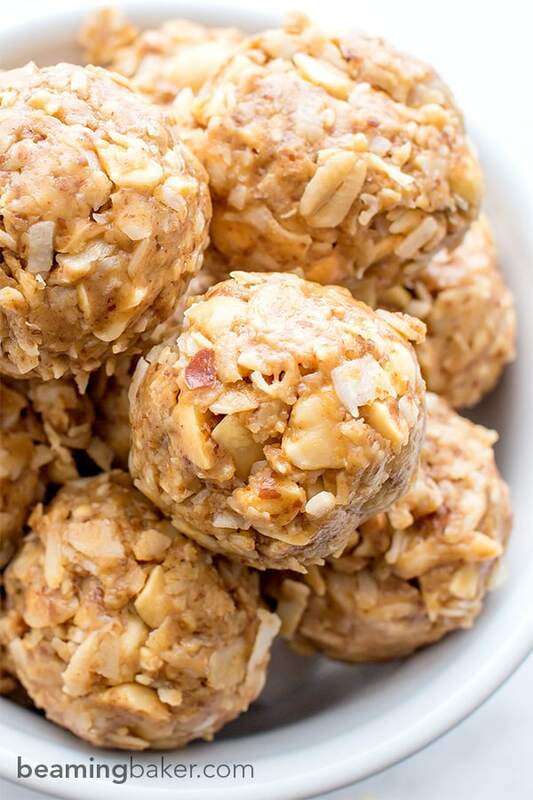 In a large bowl, mix together all of the dry ingredients: coconut, oats, flax and peanuts. Set aside. In a medium bowl, whisk together the wet ingredients: peanut butter and maple syrup. Pour wet mixture over dry mixture. Using a sturdy spatula, fold together until well incorporated. 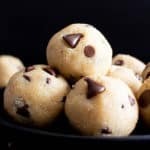 Using a cookie scoop, scoop mixture into your hands and roll into bites. If the mixture is too dry, add in a bit more maple syrup and peanut butter. - Recipe updated July 2017. - *Natural peanut butter works best for this recipe; the measurements were calculated based on the very drippy, liquidy nature of natural PB. 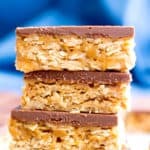 - More peanut butter recipes: no bake peanut butter oatmeal cookies, chocolate peanut butter crunch bars, chocolate peanut butter cup granola bars. 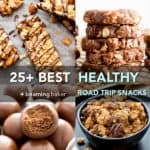 - Nutrition Info: is an estimate based on 23 total bites. - Here's the exact scoop that I use and love: 2-Tablespoon Cookie Scoop. Oh my god!! These look so good! Definitely going to make these today. By any chance do you have the nutritional info like the protein and the calories? Thanks again! Made these twice in the last two days!! So yummy, and perfect for my vegan friends. I used Earth Balance coconut peanut butter, because it’s what I had. And added 1/4 cup macadamia nuts instead of peanuts, again because it’s what I had on hand. They turned out fantastic! Everyone loved them. 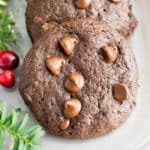 They remind me of the centers of my peanut butter bon bon cookies I make at Christmas, but without the chocolate coating. Hmmm… Thanks for the easy and yummy recipe!! what is the 21 day fix count on these? Thanks!! I added a T of cocoa powder to this…delicious! Thanks! I made these last night and brought some to the office to keep in my desk draw as a snack. I made the terrible mistake of offering some to my colleagues, needless to say they’re all obsessed with them. Prepare for an influx of site traffic today! But who can blame because its so bloody delicious!!!! 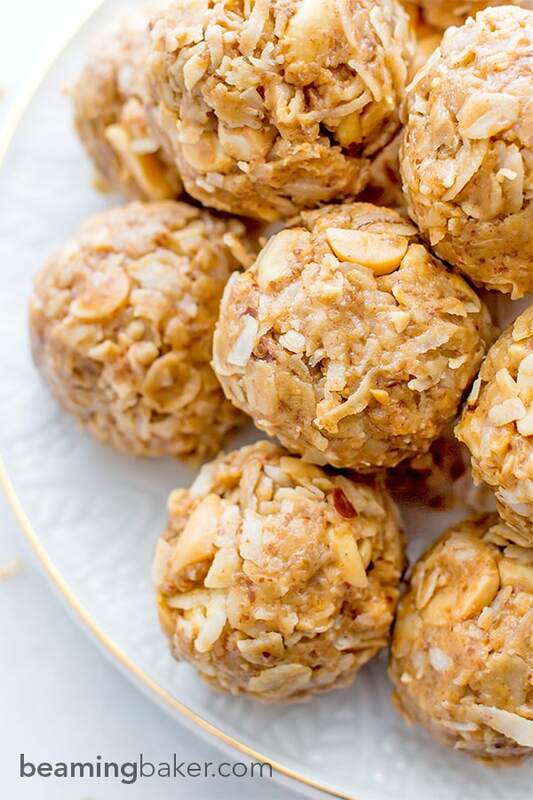 This is such a great energy snack to ward off those junk food cravings. Oh my gosh! Janis, I was so nervous when I read “terrible mistake.” Lol. I’m ready and excited about the influx! 😉 I’m so happy that you enjoyed these and had the generous nature to share. ???? Can’t wait to see what you try next! Whipped these up this morning, they look delicious! Haven’t tried them yet, but I have faith. Besides, how can you go wrong with peanut butter and coconut?! 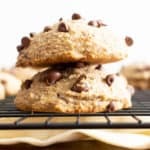 I used a little unsweetened applesauce just to make them stick together better and put some leftover chocolate chips in mine. Thank you! ???? Can I use regular pb on these in case that I can’t find any natural pb in the grocery? Is it okay if I gonna make this without flax?can’t find any. Thank you. I just made these tonight and all i can say is WOW….. this is a keeper. Even my husband said he loved them. I did not have flaxseed so I used hemp hearts and it worked out perfect. Are you using freshly grated coconut, bagged from the grocery store, or dried coconut like from my food co-op. Three choices which would probably have very different results. Thanks. Can these be stored in the freezer and taken out per use? I LOVE these and so does my daughter so I’d love to always have them on hand! 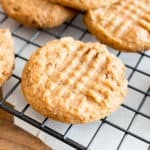 Oh wow this makes me want peanut butter and coconut bites so badly! I love that these are gluten free too since my husband has Celiac Disease.Definitely going to try these! Just made these and they are awesome! I have been using natural PB for many years now and could not go back to the old stuff! It was hard to stop at one! Woohoo!!! I’m so happy to hear it, Maureen. 🙂 Natural: I know! It’s like a totally different thing. Lol. Enjoy!